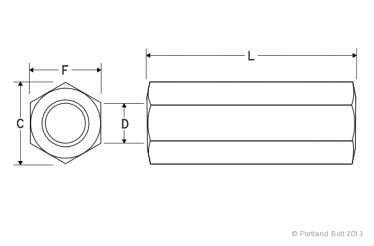 Sleeve nuts are similar to coupling nuts in that they are designed to connect two like-diameter fasteners. 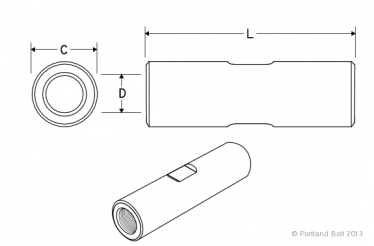 They are often used in place of turnbuckles and in combination with high strength tie rods. 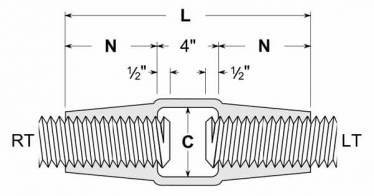 These custom nuts are typically tapped with right hand (RH) threaded on one end and left hand (LH) threads on the other end. This allows for slight adjustments and proper tensioning once assembled. They can also be ordered with right hand threads on each end. 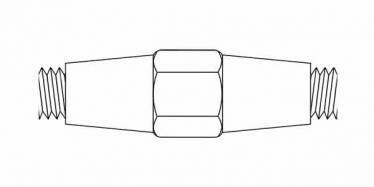 Sleeve nuts differ from coupling nuts because they are longer, tapered from the middle towards the ends, typically left hand/right hand, and there is a stop in the middle. Since hot-dip galvanizing typically adds 2.2 to 5 mils of thickness to the threaded portion of a fastener, galvanized sleeve nuts are tapped oversize to compensate for the corrosion resistant coating on the rods.